Jacob works for Laban, to win the hand of Rachel. ACOB CONTINUED ON his way, getting ever farther away from his brother Esau's wrath. At last he reached Haran, the place where his uncle Laban dwelt. He saw a green field, and in the field a well. Three flocks of sheep were lying there, resting, and waiting to be watered. As Jacob drew near he greeted the shepherds and asked them whether they knew a man named Laban. 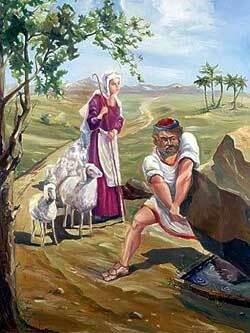 They replied, "We know Laban, and here, behold, Rachel, his daughter, cometh with the sheep." As Rachel approached, looking sweet and beautiful, Jacob was deeply touched. He rolled away the stone which covered the well and watered the flock of Laban. Then he embraced his young cousin and lifted up his voice and wept. When Rachel learned who Jacob was, she hastened to tell her father, Laban, and he greeted Jacob joyfully, and made him welcome in his home. Jacob remained in Laban's home for a month, tending the flocks and herds. When Laban asked him what wages he wanted to receive, Jacob rescued any money, but said, "I will serve thee seven years for Rachel thy younger daughter." Jacob wished to have Rachel for his bride, for he had already begun to love her dearly. Laban thought this was a very good bargain, and readily agreed. Jacob toiled for seven years in his uncle's service, and the time seemed to pass very quickly, for he knew that at the end of that time he would win the hand of A great wedding feast was prepared, and the wedding day came at last. Jacob was full of happiness, but, alas Laban deceived Jacob, and forced him to marry Leah, the older daughter instead. Jacob was very angry at this, but Laban explained that a younger daughter cannot marry first, but would have to wait until the older daughter was married, so that Jacob would have to work for him seven more years if he also wanted to wed Rachel. So Jacob, who had cheated his brother, was now cheated in turn. Jacob worked for seven more weary years, always remembering, however, that at the end of this time he would win the hand of his beloved Rachel. Finally, after seven more years had passed, Jacob also married Rachel, and now he was happy at last.